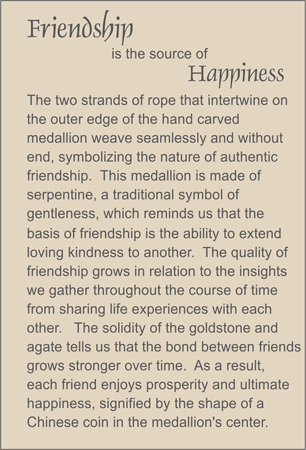 Poppy-colored serpentine hand carved medallion showing two ropes intertwining seamlessly and without end around the shape of a coin for prosperity. Accented with goldstone, replica ancient Chinese coin, black agate, and black tassel. HAPPINESS is a great gift for favorite teacher.